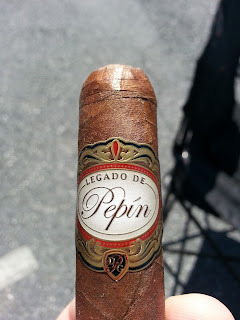 Appearance (0-20): While there really isn’t anything to scoff at when approaching the Legado De Pepin, there is also very little that jumps out at you and says “BUY THIS CIGAR NOW!”. The band is relatively unremarkable, and the cigar itself shows a multitude of smaller veins on a medium brown colored Nicaraguan wrapper. But it doesn’t have any major knocks against it either. It’s more or less unremarkable and one I may have passed over if I didn’t notice it was a Pepin blend, which I’m typically partial to. Construction (0-20): The only constructionary (yeah, I made that word up) complaint I had would revolve around it being a little tight on the draw. The cut was beautiful and contained almost no debris, it felt slightly spongey to the touch, and burned both straight and consistently. The ash held for two+ inches at a time and didn’t flake at all. Strength (0-20): Listed in the full range, I can tell you it definitely has the kick to be there, but I didn’t think it actually had that sort of longevity. If anything this is more a medium stick that peaks into the full realm from time to time. I was slightly disappointed by this. Flavor (0-20): Before even lighting up, it’s easy to taste some hey and sweetness on the draw. Post lighting there are some wonderful earthy tobacco tastes that are mixed with some slight bitter coffee. The bitterness isn’t overpowering, but is well balanced quickly with some delightful dark chocolate notes that follow. As the stick progressed, there is more of a spicy pepper flavor that ends up being present. Unfortunately, there is also a bit of a grassy flavor that’s distracting from the core flavors. Even more disappointing is that the stick remains stagnant with the same flavor through the rest of the smoke. Value (0-20): $8.00 feels like I am more paying for the Pepin name than an outstanding cigar. Unfortunately I wouldn’t be able to justify buying another at said price. Overall (0-100): This Pepin blend is one that may have fallen by the wayside for me if I hadn’t seen his name on it. 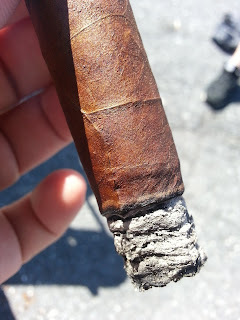 The actual look of the cigar gave no real pop, and it was actually kind of indicative of the experience overall. Nothing really shined for me here – the price is a bit steep, the strength is weaker than expected, and the flavor mixture is solid but is both one dimensional and a little distracted by the grassy flavor that comes through. I guess I expected more of Pepin. It’s not the worst blend I have had, but I would likely pass on buying one at retail price.